Red Oak derives its name from Red Oak Creek which flows through the community and was noted for the red oaks on its banks. The first settlers arrived there in the 1850s. 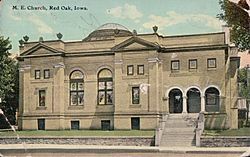 In 1865 it became the official county seat of Montgomery County and the courthouse which had been in the middle of the county seven miles east in Frankfort, Iowa was towed to the community during a snow storm. That courthouse remained in place until the current Montgomery County Courthouse was built in 1891. It is on the National Register of Historic Places. In 1869 the community was officially founded when the Chicago, Burlington and Quincy Railroad (called the Burlington and Missouri River Railroad at the time) arrived. The community was named Red Oak Junction by the railroad on March 20, 1876. The junction was a line off the main Chicago to Council Bluffs, Iowa line that went to Nebraska City, Nebraska and on to Lincoln, Nebraska. The Junction name was dropped in 1901 although the community continues to celebrate its history each summer in Junction Days. In 1903 a new depot was opened by the railroad. It today serves as a museum celebrating the community's significant military heritage and its disproportionate number of casualties in various wars and most famously in World War II. The depot is one of nine places in Montgomery County on the National Register of Historic Places listings in Montgomery County, Iowa. Darwin R. Merritt, born in Red Oak on April 12, 1872, graduated third in his class from the United States Naval Academy in Annapolis, Maryland on July 1, 1897. On February 15, 1898, he perished in the explosion that sank the USS Maine (ACR-1) in the harbor of Havana, Cuba. His body was later recovered and interred in Evergreen Cemetery in Red Oak. The community has had a disproportionate number of casualties in the Civil War and World War II. In the American Civil War, the area provided more Union troops per capita than any other in the state. Company M (which also included residents from Montgomery County) had 160 casualties among its 250 members; 52 men were killed in action. Early World War II battles claimed a disproportionate number of soldiers from Red Oak (although the final casualty statistics tend to disprove the oft-repeated statement that Red Oak suffered more losses per capita than any other American community). In the Battle of the Kasserine Pass in February 1943, forty-five soldiers from Red Oak alone were captured or killed. At the time more than 100 telegrams arrived in Red Oak saying that its soldiers were missing in action. In recognition of Red Oak's extraordinary sacrifice, the city's name was given to a "victory ship". The SS Red Oak Victory has become a floating museum in the shipyard where it was built, in Richmond, California. The old Burlington Northern depot has been transformed into a museum telling this history. The Red Oak School District was established in 1870, while Webster Eaton first published the Red Oak Express newspaper in 1868. Red Oak is located at (41.011681, -95.227227). According to the United States Census Bureau, the city has a total area of 4.01 square miles (10.39 km2), of which, 3.95 square miles (10.23 km2) is land and 0.06 square miles (0.16 km2) is water. As of the census of 2010, there were 5,742 people, 2,481 households, and 1,475 families residing in the city. The population density was 1,453.7 inhabitants per square mile (561.3/km2). There were 2,887 housing units at an average density of 730.9 per square mile (282.2/km2). The racial makeup of the city was 96.3% White, 0.3% African American, 0.4% Native American, 0.2% Asian, 1.4% from other races, and 1.3% from two or more races. Hispanic or Latino of any race were 4.2% of the population. There were 2,481 households of which 28.7% had children under the age of 18 living with them, 42.7% were married couples living together, 11.8% had a female householder with no husband present, 5.0% had a male householder with no wife present, and 40.5% were non-families. 34.9% of all households were made up of individuals and 16.8% had someone living alone who was 65 years of age or older. The average household size was 2.26 and the average family size was 2.90. The median age in the city was 42.2 years. 24.4% of residents were under the age of 18; 6.6% were between the ages of 18 and 24; 22.2% were from 25 to 44; 26.6% were from 45 to 64; and 20.1% were 65 years of age or older. The gender makeup of the city was 47.6% male and 52.4% female. As of the census of 2000, there were 6,197 people, 2,670 households, and 1,650 families residing in the city. The population density was 1,684.7 people per square mile (650.2/km²). There were 2,985 housing units at an average density of 811.5 per square mile (313.2/km²). The racial makeup of the city was 97.42% Caucasian, African American African American (U.S. Census), 0.11% Asian (U.S. Census), 0.50% Native American, 0.37% Asian, 0.02% Pacific Islander, 1.11% from other races, and 0.47% from two or more races. Hispanic or Latino of any race were 2.15% of the population. There were 2,670 households out of which 28.7% had children under the age of 18 living with them, 47.6% were married couples living together, 10.7% had a female householder with no husband present, and 38.2% were non-families. 33.8% of all households were made up of individuals and 16.8% had someone living alone who was 65 years of age or older. The average household size was 2.27 and the average family size was 2.89. Age spread: 24.6% under the age of 18, 7.0% from 18 to 24, 25.7% from 25 to 44, 21.9% from 45 to 64, and 20.8% who were 65 years of age or older. The median age was 40 years. For every 100 females there were 83.0 males. For every 100 females age 18 and over, there were 79.9 males. The median income for a household in the city was $30,098, and the median income for a family was $37,007. Males had a median income of $28,942 versus $20,047 for females. The per capita income for the city was $15,793. About 7.9% of families and 10.3% of the population were below the poverty line, including 14.8% of those under age 18 and 6.2% of those age 65 or over. Red Oak had a horse-drawn streetcar system from 1882 to 1901. It has a transmitter for the Iowa Public television system. Red Oak is mentioned in Willa Cather's 1912 short story The Bohemian Girl. Red Oak, Iowa Facts for Kids. Kiddle Encyclopedia.